The laser is a vital tool for manufacturing, research, and medicine. However, there are potential hazards associated with their use, in particular Class 3B and Class 4 lasers or laser systems. 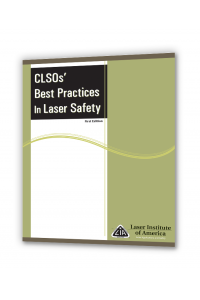 CLSOs' Best Practices in Laser Safety concentrates on how to address Class 3B and Class 4 laser hazards and their safe operation. The book is a compendium of procedures, policies and practical advice to be used by laser safety professionals. An international team of twenty laser safety experts and Certified Laser Safety Officers from the industrial, medical and academia fields volunteered their time and effort to create this benchmark reference handbook.